CLEVELAND — Cleveland Indians second baseman Jason Kipnis is grinding through the worst season of his career, but manager Terry Francona hasn’t lost faith in his second baseman, who is expected to be in the starting lineup Wednesday night, when Cleveland hosts the Minnesota Twins in the third game of a four-game series at Progressive Field. He’s had a couple injury-plagued seasons, but in 2018 he’s been healthy, but his batting average has not. Kipnis is hitting just .220. That would easily be a career low for him, but Francona remains loyal to his 31-year-old second baseman. Kipnis’ inconsistent season is reflected in his last three games. In the first two, he was 3-for-6 with one home run and two RBIs. Tuesday night he was 0-for-4 with three strikeouts. Wednesday’s pitching matchup will be two pitchers who have gone a month since their last wins. Minnesota’s Jake Odorizzi, who hasn’t won a game since July 8, will face Cleveland’s Mike Clevinger, who hasn’t won a game since July 1. 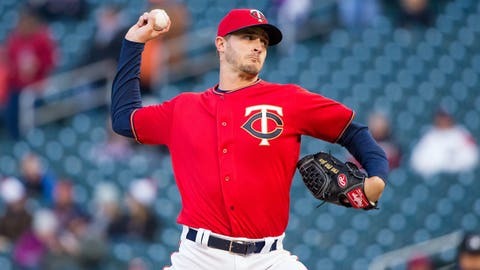 Odorizzi’s last start came on Aug. 3, a 6-4 Twins win over Kansas City in which Odorizzi did not figure in the decision. In that game his start lasted just 3 1/3 innings, due to a long rain delay. He gave up two runs and four hits, with two strikeouts and no walks. Wednesday will be Odorizzi’s fourth start against Cleveland this year. In the first three, he was 0-2 with a 9.88 ERA. In seven career starts against the Twins, he is 1-3 with a 6.47 ERA.